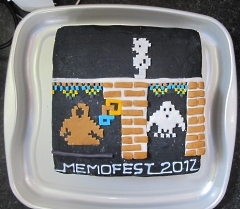 As is traditional, the event featured a Memotech themed cake. This year, the cake's "flavour" was Pot-Hole Pete. The cake was a very nice fruit cake baked by Martin's mum and iced by his sister. I can vouch for the quality of the cake as Martin kindly sent me a sample after the event. As I was not able to take much part in this year's event, I have gathered together some of the info and photos posted by Andy on his website and Mark's post on Memorum and posted them below. 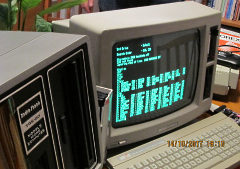 The monitor on the left is displaying the VGA output from CFX-II with the mono monitor displaying the normal MTX composite video output. Caution : Blatant plug to follow . . . . 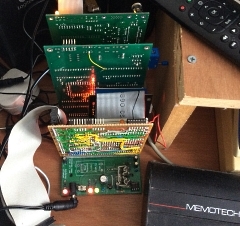 Under the cover is a Z80 running at 9.8304 Mhz (the odd speed is a consequence of the requirements of the serial connection), memory, CTC, SIO and serial to USB adaptor, plus the various support chips. On the other side of the connector is a propeller video display from the CFX built onto a MTXplus+ compatible connector. 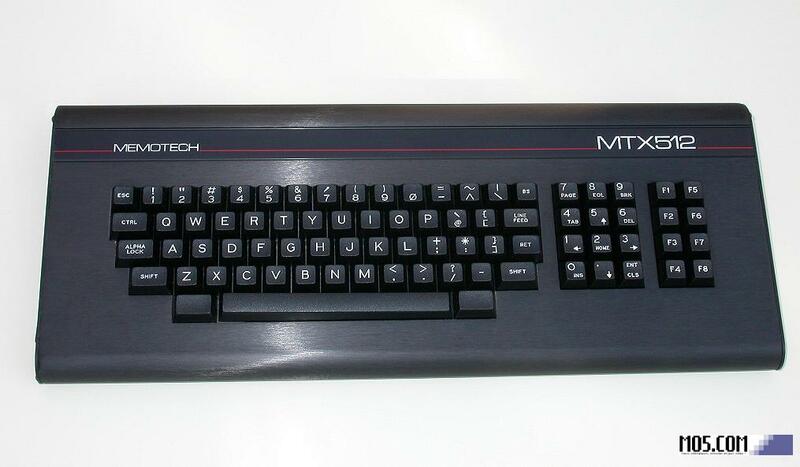 In theory it could run MTX basic, however it would need the display handler re-written. 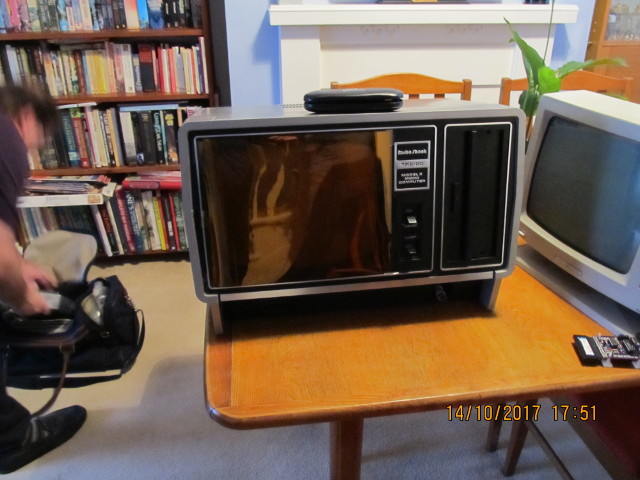 With only the 80 column display it's really intended to run CPM. 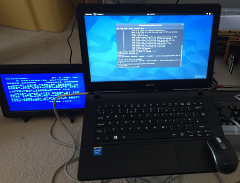 Which it will, using the same disc images as the CFX and CFX-II, booted from a modified CPM rom. 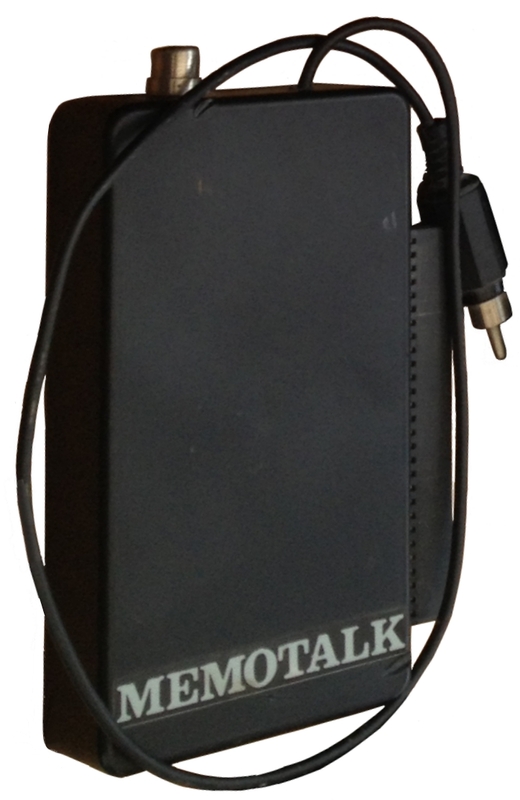 We had demo'ed MTXPlus+ at Memofest 2016 and until then, I believed that it would be 100% software compatible with the MTX. 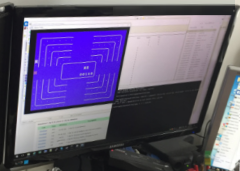 Subsequently, Andy did some investigation of the incompatibilities and was able to demo a version of HEX-TRAIN for MTXPlus+ at this year's Memofest - thanks Andy ! 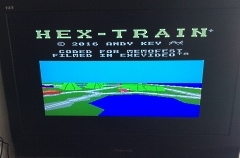 You can read Andy's description of how he managed to get HEX-TRAIN working on MTXPlus+ on his website here. 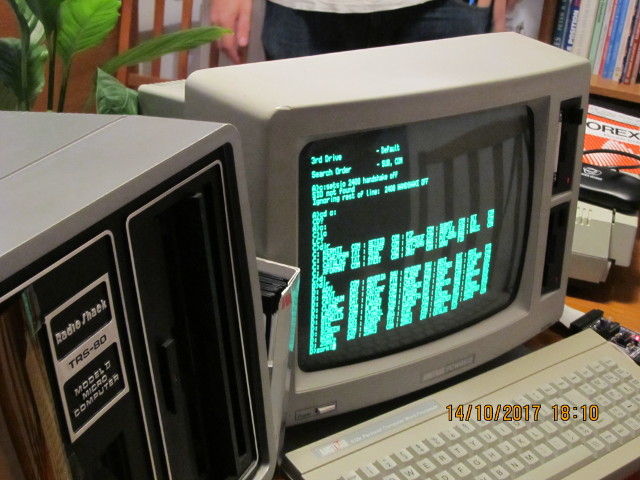 Jon Bradbury took along some random hardware . . . .
A Tandy/Radio Shack TRS-80 Model II . . . . 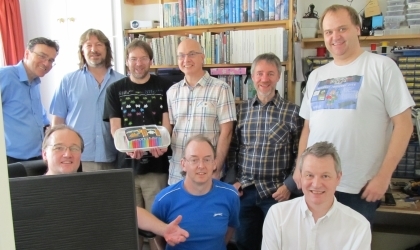 Although he did not attend the event, Tony Brewer had kicked off a Z80 coding challenge to be judged at the event. See this Memorum page for details. Although there were a number of entries, nobody was able to beat Tony's model answer, so no winner was declared. Paul Daniels showed off his new game. From afar (Singapore) it looked like a PacMan variant, but Martin has advised that it's a combination of driving game and PacMan. 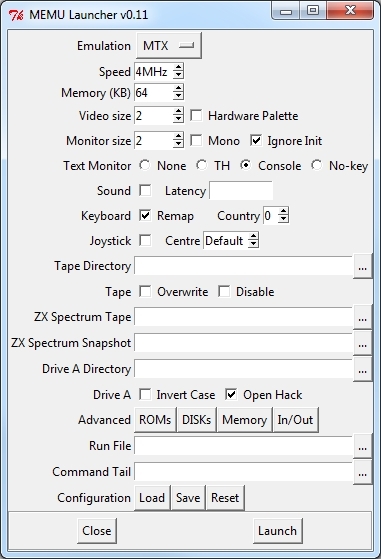 The player drives in one direction, the CPU in the other. 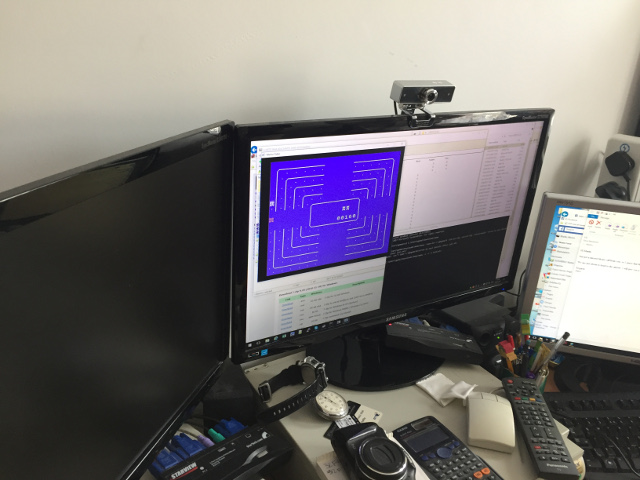 The player has to collect the dots avoiding a head-on crash with the CPU car. 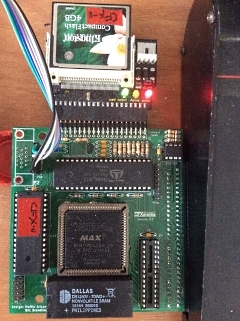 As usual, Andy had something clever to show, this time, it was his additions to the SDX boot ROM that included a "Remote Control" feature, allowing data to be loaded to the MTX over the RS232 port. Bill demonstrated his "Launcher" - a Python script that takes the hard work out of using MEMU's many command line parameters. I really like Launcher - particularly as Bill included quite a few "nice-to-haves" at my request - thanks Bill ! The webpage also includes a Gamebase installation, built by Paul for MEMU. 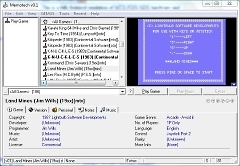 As described on Andy's page, "we spent a little time trying to set up Gamebase to run MEMU. If MEMU displays an error and terminates, it writes a message to stderr, but this does not result in a pop-up error window in Gamebase, making it a bit tricky to diagnose problems." 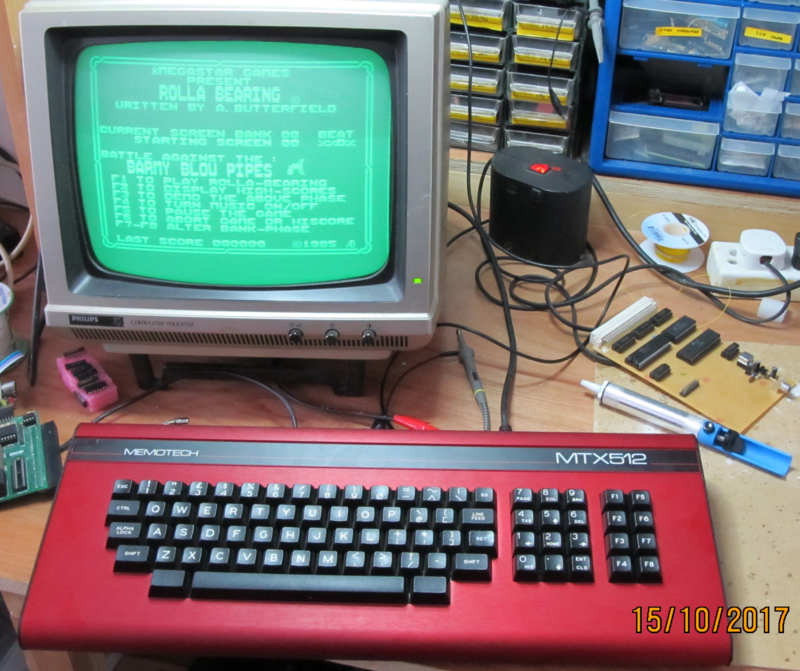 The first patient on the table was Paul's MTX which had an intermitten video fault. Due to luggage limitations, Paul only brought the suspect Video daughter board along to Memofest 2016, but the daughter board proved to be working fine. This year, will the complete MTX available, the prospective surgeons (Mark and Andy) were unable to reproduce the fault, so no progress was made on the day. 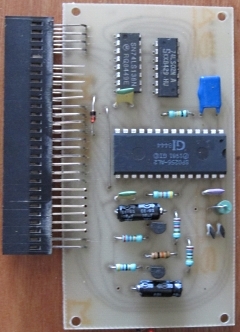 However, the following day, Martin noticed that it "looked like one of the capacitors on the Video Daughterboard could possibly be shorting to a via on motherboard. One small piece of insulating tape later the potential short was history. An hour long soak test and still no problems so hopefully that's one system fixed at least for now. " 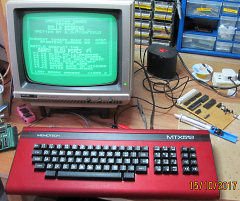 The 2nd repair booked for Sunday Morning was Jim with his red MTX, which had no display. I plugged in the CFX-II board so that the start-up screen would give us a display to help diagnose the corruption of "Ready" into "Seady" and it was obvious that the lowest bit of the display ram wasn't outputting correctly. 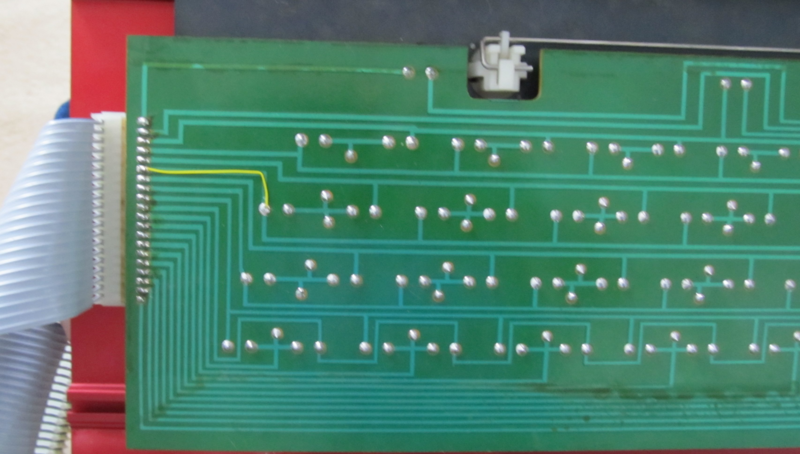 The Circuit diagram suggested this should be the chip in location G4 which we confirmed with a 10R resistor grounding Pin 14. 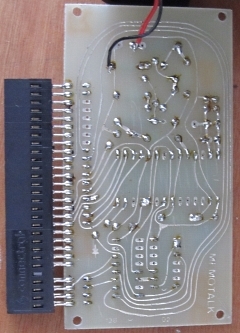 That chip came out and was replaces with a socket and one of the re-cycled 4116 chips from the spares box. 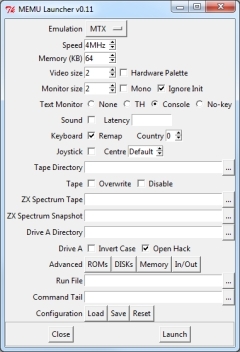 Video corruption solved. 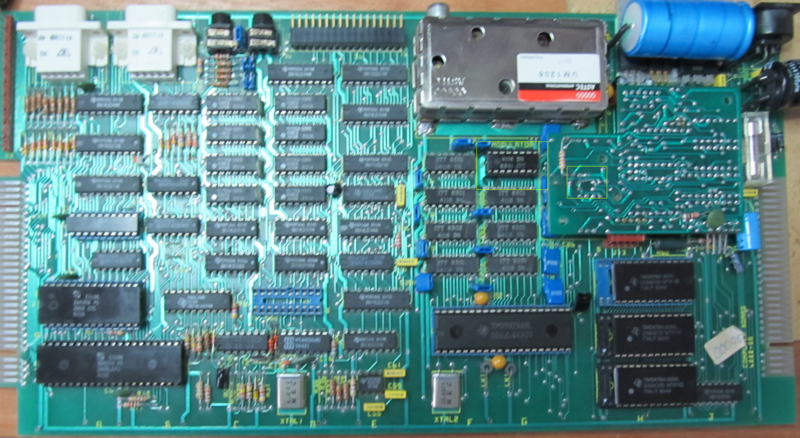 Next up was fitting the Magrom internally and a "test" of some of the games. That revealed a 3rd problem, the "H" key didn't work. Changing the cable didn't change anything so we connected my keyboard, that worked as expected, confirming the motherboard was fine and that the issue was the keyboard itself. Experimentation confirmed it wasn't just the "H" key, but also "F" Cursor right and a few others. 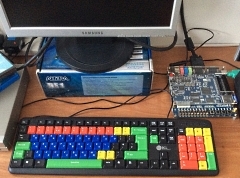 All keys connected to the same pin on the keyboard connector. Tracing with the meter confirmed a break in between the connector and the first of the keys connected to it. Being a Memotech, that required a yellow wire to restore connection. With (hopefully) everything now fixed we were able to test the Magrom and confirm for now at least the Ultra Rare RED MTX WoW!! 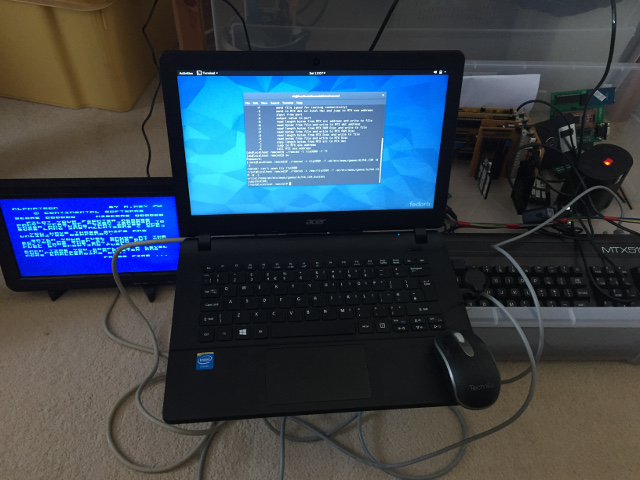 is working. And Jim was finally able to head for home with his repaired MTX and a large chunk of the Pothole Pete themed cake as souvenirs of his trip to the South Coast.